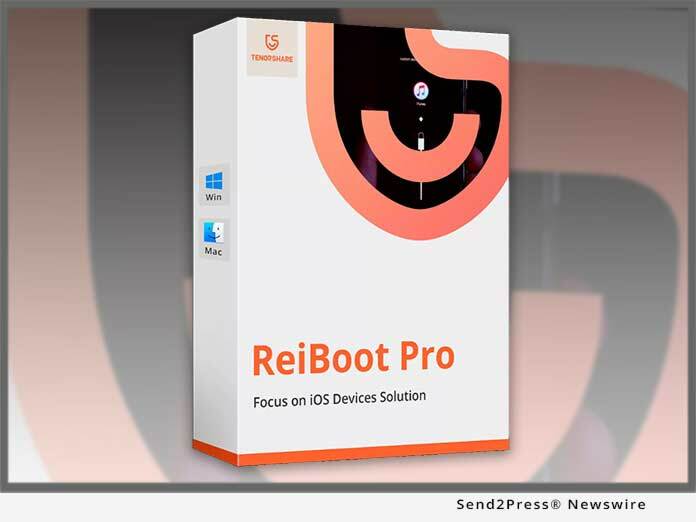 NEW YORK, N.Y., Sept. 20, 2018 (SEND2PRESS NEWSWIRE) — Tenorshare has released the newest ReiBoot 7.1.2, which is perfectly compatible with iOS 12 and fixes all iOS 12 update and stuck issues. Such as: an error occurred while installing iOS 12, iPhone stuck on update requested, attempting data recovery, preparing update, recovery mode, black screen, Apple logo screen, frozen or unresponsive screen issues, etc. iPhone/iPad Screen Stuck Problems: iPhone frozen screen, iPhone while screen, Blue screen of death, iPhone black screen, Connect to iTunes screen, iPhone recovery mode loop, etc. iOS Mode Stuck Issues: stuck on recovery mode, stuck on DFU mode, stuck on headphone mode, stuck on zoom mode, stuck on shuffle mode, stuck on restore mode, stuck on safe mode, stuck on mute mode, etc. Other iOS device bugs: iPhone stuck on Apple logo, iPhone screen frozen. iPhone won’t turn on, iPhone is disabled, iPhone stuck on verifying update, iPhone won’t charge, etc.